Tomato is one of the most common vegetables found across the world. On account of its versatile utility, tomato fruit is the main theme of innumerable recipes into which other vegetables added to prepare specific varieties. The fruit of tomato is the base ingredient in almost all types of side-dishes. The unripened green fruit of tomato tastes tart and sour; the mature ripened (usually red) fruit is a mixture of sweetness and sourness. The ripened tomato is a juicy fruit and contains soft pulp inside along with a cluster of minute seeds attached to inner septa. The universal agreeability of its taste has made the fruit popular all over the world. The ripened fruit is extensively used in multi-cuisine delicacies and the slices of ripened but uncooked fruit are eaten as salad. 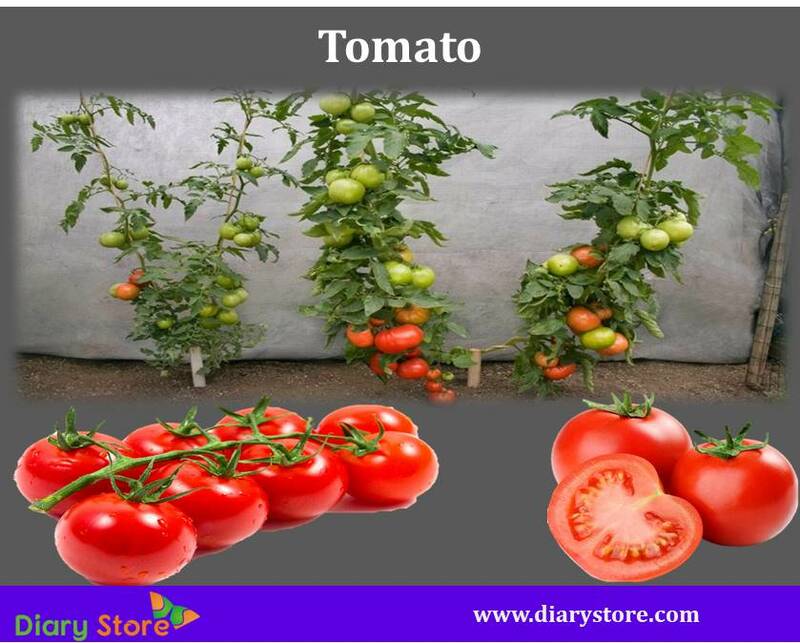 The scientific name of tomato is Solanum lycopersicum. The plant is mainly grown for its fruits. Tomato fruits are round, oval or oblate (flattened at the top and bottom), elongated or pear shaped. Tomato seeds are sown in red or black soil capable of absorbing water. Drainage of excess water from the soil should be ascertained. The pH value of soil can be between 6 – 7.5 for proper germination and growth. Modern methods of farming include keeping tomato fruits out of contact with ground to allow good aeration to the plant. Using trellis or lifting the twigs by props to keep them at an elevated height would improve the chances of better quality and higher amount of yield. Before sowing the seeds or saplings, soil can be kept warm by covering the yard with tarpaulin. Growing in green houses has advantage of keeping the plants away from a variety of insects which would otherwise attack the crop in open fields. Use of pesticides is considerably reduced while growing in protected environment like net houses or poly houses. Saplings should be exposed to sun for a minimum of 8 to 10 hours every day. Weeding and thinning are compulsory activities to prevent damage to the growth of plants. Wilting leaves or twigs affected by blight have to be pruned off to ensure comfortable survival of crop. Nutrition values are based on 100 grams of tomato fruit. (The notations mg = milligrams and μg = micrograms). 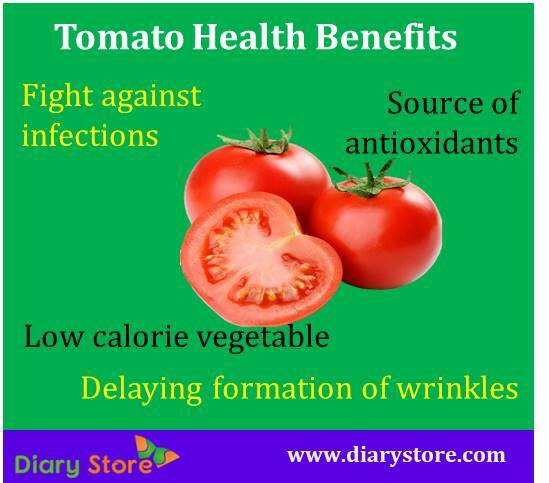 Tomatoes are low calorie vegetables and a good source of antioxidants which have potential to cure cancers affecting colon, prostrate, breast, lung, uterus, lung and pancreas. The flavonoid antioxidant Lycopene is exclusively found in tomatoes. This phytochemical compound along with other carotenoids is believed to shield the body from pernicious oxygen-free radicals. Copious presence of another flavonoid Zeaxanthin in tomatoes is helpful in preventing age related macular degeneration effecting eyes. Abundance of flavonoid oxidants like alpha and beta carotenes, xanthins, lutein and appreciable levels of vitamin A makes the vegetable all the more important for good health. All these compounds collectively can exhibit antioxidant characteristics like improving night vision, bone strength, muscular health and delaying formation of wrinkles on skin due to advancing age in older people. Vitamin C, being in rich quantities in tomatoes, is a good nutrient to fight against infections and improving the strength of endoskeleton. Relatively larger presence of potassium compared to sodium (a ratio of 237 mg: 5 mg in 100 grams of tomato) is considerably helpful in negating the harmful effects caused by sodium in blood pressure and pulse rate. Modest levels of vitamins pertaining to B group support various metabolic activities and improve muscular strength. As a universal choice in the comity of vegetables, tomato occupies the top position among the most preferred items in routine diet. Except for people suffering from kidney stones and other renal complications, tomato is well recommended by medical professionals to be eaten in regular repast.